In the land of a 1,000 lakes and lush northern forests, nothing can surpass this area’s natural beauty for a memorable riding destination. Visitors to the Grand Rapids area have come for generations to enjoy the many recreational activities. This includes golf, boating, fishing, and a multitude of other opportunities including biking. 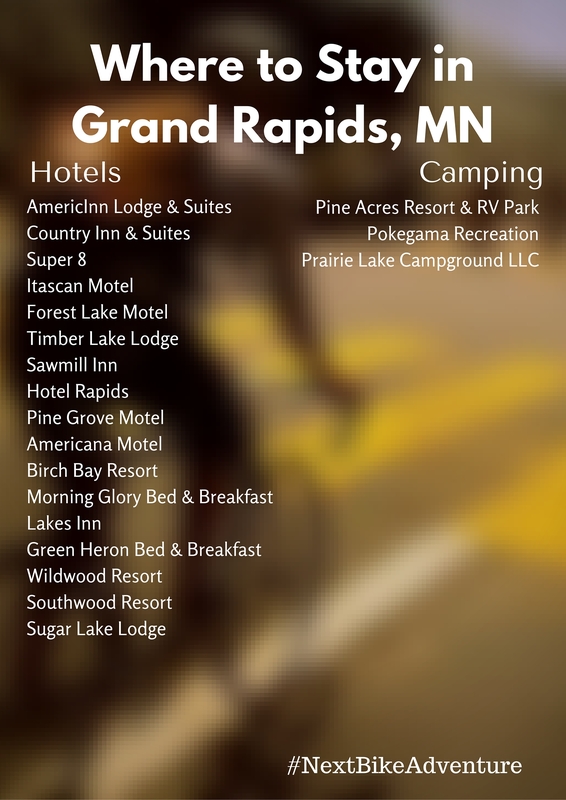 In exploring Grand Rapids, you’ll find the southern gateway to the Mesabi Trail and the Chippewa National Forest roads and trails that will create memories that will last a lifetime. Explore and enjoy the beauty of the lakes and forests in and around the Grand Rapids area. 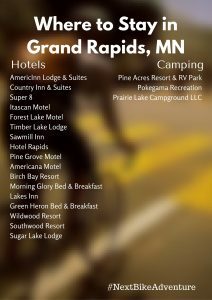 A part of Northeast Minnesota, Grand Rapids is rapidly developing into some of the finest bike trails in the state. Both the Itasca County Bike Trail and the Mesabi Trail begins at the fairgrounds in Grand Rapids, with the county trail heading north for five miles to Prairie Lake. The Mesabi Trail ventures east, through 25 communities, currently covering 115 miles of well-mapped and maintained paved trails. For road riding folk, choose from the many scenic loops. Many follow sections of the Mississippi River Trail and meander through parts of the Chippewa National Forest. For the mountain bikers, there are miles of varying terrain through state forests and on old logging roads. If you’re looking for a challenge, then there are several challenging terrain parks in the area such as the Tioga Bike Park. From the Macrostic Art Center, the Forest History Center, and Children’s Museum, families will be delighted when not exploring the trails. For the “Wizard of Oz” fans out there, find out more about her childhood in the Judy Garland Museum. From the Brewed Awakenings Coffeehouse to dining at the Forest Lake Restaurant, the Grand Rapids Area also offers several interesting and charming cafes and ice cream shops. With such a gorgeous place, you cannot help but stay a while. These places are there for you to rest up and head back out for another adventure. Along with most hotels, many coffee shops and restaurants have Wi-Fi available. Additionally, the public library is another good option. The Grand Rapids Library is located at 111 Library Street N.E., Grand Rapids, MN 49503 and can be contacted by phone by calling 616-988-5400. See the Grand Rapids Tourism Bureau for more detailed information. This entry was posted on June 7, 2016 by Russ Lowthian.